One of the things that comes with being a preacher is that you are asked to listen to a lot of other preachers. I am not sure why this is the case, but people tend to tell me of a preacher they like and one that I "must listen to". There are a sorts of preachers out there. In school we learned about a number of styles and archetypes. I can argue the theological underpinning of a 'dialogical sermon' until the cows come home. I can tell you about the "Lowry loop" and the difference between inductive and deductive preaching. No matter how many preachers I hear I continue to find there are two types. There are those who use scripture as a diving board and those who understand scripture as the water in which we swim. You can spot a diving board preacher rather easily. This is the person who reads scripture and then jumps to the point they want to make. They are found in the mainline and are most prominent in the "Bible Churches" I hear. 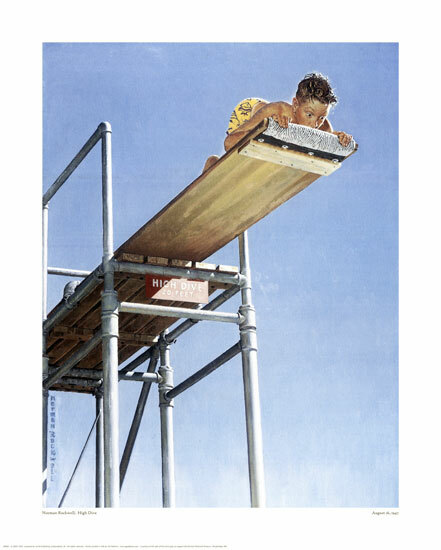 Anytime someone gives you a dozen of verses from a half-dozen books over the course of a sermon, you are dealing with a diving board preacher. Anytime you hear a preacher who uses scripture as a jumping off point, they are diving. Those who preach and understand scripture is not a jumping off point to deliver "keys to a healthy marriage" or "three steps to your best life now", these preachers understand scripture is the pool we swim in. These are the preachers who are more story driven, more interested in delving into the richness of the scripture that they are not really interested in overlaying moralistic or "practical advice" on the scripture. They are far more interested in swimming in the text, even willing to tread in the water and not go anywhere. These preachers sometimes do not have a "point" because the verses read do not have a direction (see the end of Jonah). Perhaps the church could use a little more swimmers and a lot less divers.